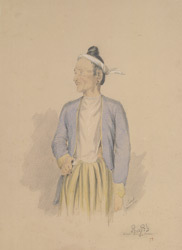 Watercolour with pen and ink of a portrait of Kiouk-Kei, a Karen, at Kemmendine a suburb of Rangoon from 'A Series of Views in Burmah taken during Major Phayre’s Mission to the Court of Ava in 1855' by Colesworthy Grant. This album consists of 106 landscapes and portraits documenting the British embassy to the Burmese King, Mindon Min (r.1853-1878). Inscribed with sitter's signature in Burmese script. The mission started from Rangoon (Yangon) and travelled up the Irrawaddy (Ayeyarwady) River to the royal capital of Amarapura, founded in 1782. Grant (1813-1880) was sent as official artist of the mission, while Linnaeus Tripe was the photographer. The Karen live throughout central and southern Burma, and in the 19th century formed the chief population of the south-west section of the Shan States and of Tenasserim. Grant wrote that this man was: a 'Friend, adviser, and co-patriot' of Kyan-Lau-Gee, whose portrait is also in this album.